For the wine region named Swan Hill, see Swan Hill wine region. 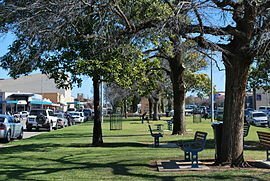 Swan Hill is a city in the northwest of Victoria, Australia on the Murray Valley Highway and on the south bank of the Murray River, downstream from the junction of the Loddon River. At the 2016 census, Swan Hill had a population of 10,905. In the Dreamtime, (from the area now known as Swan Hill) ran out of spears while chasing the cod. This chase is part of the mythology of the creation of the Murray River. Based on evidence from Coobool Creek and Kow Swamp, it appears that Aboriginal people have lived in the area for the last 13,000–9,000 years. The area is inhabited by the Wemba-Wemba and people. Swan Hill was called "Matakupaat" or "place of the Platypus" by the Wemba Wemba people. The area was given its current name by explorer Thomas Mitchell, while camping beside a hill on 21 June 1836. Among the reeds on the point of ground between the two rivers was a shallow lagoon where swans and other wild fowl so abounded that, although half a mile from our camp, their noise disturbed us through the night. I therefore named this somewhat remarkable and isolated feature Swan Hill, a point which may probably be found to mark the junction of two fine streams. The European community grew up around a punt river crossing, which was established as early as 1846. This crossing serviced the growing agricultural area, and was the only river crossing for 100 km. The Post Office opened here on 1 February 1849. In 1853 Francis Cadell navigated the Murray river from its mouth in South Australia to Swan Hill in his paddle steamer, Lady Augusta. He arrived on 17 September 1853, narrowly beating William Randell of Mannum, who arrived 4 hours later in the PS Mary Ann. This demonstrated the feasibility of river traffic, which flourished until the introduction of the railway. Swan-hill is a small, and, notwithstanding its 20 or 25 years of existence, not very flourishing, township… The population does not exceed 100 persons, but the township can boast of a substantial post and telegraph office, which is the principal building in the place. There is a church built of brick, belonging to the Church of England, and a small wooden chapel owned by some other denomination. The hospital, for Swan-hill can also boast of a hospital, is prettily situated at the junction of the Little Murray with the main stream. The district around the town is principally pastoral. About 10 or 12 miles distant there is a salt lake, from which a coarse salt is obtained and exported to Riverina and the Upper Murray. There is a mail three times a week, and the township is already connected with the metropolis by telegraph. In 1883 the first of several red brick water towers were built to supply the growing town with water. Water was pumped out of the river and into the top of the tower by a wood-fired steam engine, and then flowed by gravitation to surrounding businesses and private residences. Many of these towers can still be seen around town. The railway from Bendigo was extended from Kerang to Swan Hill station in May 1890, being extended to Piangil in 1915. The punt river crossing was replaced by a timber truss, steel lift span bridge in 1896. The first six telephones were connected in Swan Hill on 2 October 1911. The National Bank was phone number 1. In 1914, Isaburo (Jo) Takasuka produced the first commercial rice crop in Australia. He grew Japanese (Japonica) varieties on 200 acres (81 ha) of flood prone land on the Murray River near Swan Hill. The Chinese had been growing rice in Australia since at least 1877. Swan Hill became a city in 1965. The Burke and Wills expedition reached Swan Hill on Thursday, 6 September 1860 on their journey across Australia from Melbourne to the Gulf of Carpentaria. They made Camp XV (their fifteenth camp out of Melbourne) in the police paddock on the banks of the Murray River in an area that is now Riverside Park. The expedition stayed in Swan Hill until Monday, 10 September while they reorganised the stores. Burke dismissed four men; Essau Khan, Brooks, Lane and John Polongeaux. He then hired Alexander McPherson, a saddler from Epsom and Charlie Gray, a former sailor from Scotland who had worked as an ostler for Cobb and Co between Bendigo and Swan Hill and who was now employed at the Lower Murray Inn in Swan Hill. The party was strengthened further by the arrival from Melbourne of journalist, William Hodgkinson, and scientist Georg von Neumayer. The local inhabitants gave the expedition a rousing farewell as they crossed into New South Wales. Folklore alleges Burke and Wills planted a Moreton Bay Fig tree in the garden of the local doctor, Dr B W Gummow. The tree is now approximately 27 metres high and has a branch spread of approximately 44 metres and can be seen in Curlewis Street. The Murray River road bridge over the Murray River connects McCallum Street in Swan Hill to the Swan Hill Road in Murray Downs in New South Wales. The bridge is listed on the New South Wales State Heritage Register. Swan Hill gives its name to a wine region straddling the Murray River. The vines are predominantly irrigated from the river. Swan Hill has a semi-arid climate with hot summers and cool to mild winters. Around 88% of the people living in Swan Hill were born in Australia. Migrants account for around 12 per cent, these include Italy (1.4%); England (1.0%); New Zealand (0.4%); Scotland (0.3%) and Afghanistan (0.3%). 3.2% of the population are Indigenous. In Swan Hill there are four primary schools, two secondary schools and three schools which run both primary and secondary syllabuses. These are Swan Hill College, MacKillop College, St Mary's Primary School, Swan Hill Primary School, Swan Hill North Primary School, Sun Centre Christian School, Victorian P-12 College of Koorie Education - Payika Campus and Swan Hill Specialist School. Swan Hill College is well known for its anti-drug program. Tertiary education is delivered by Sunraysia Institute of TAFE. Its main campus is at Tower Hill, and it runs a farm north of the city. As well as its own courses, it offers a Deakin University program. Swan Hill is the heart of the Central Murray Football League. It is also the home to two football clubs, the Swan Hill "Swans" and the Tyntynder "Bulldogs". Swan Hill also has Futsal Swan Hill providing senior futsal in Swan Hill, both men's and women's leagues, 2 men's divisions and 1 women's division. Established in 1995 the competition regularly features over 30 teams each season. The Swan Hill Junior Soccer League that consists of over 500 children. They also field 3 teams in the Bendigo Amateur Soccer League  where their Senior Men's Division 2 Team won the Knock-Out Cup in 2006. The Youth Team has come runner up in the Knock-Out Cup competition in both 2006 and 2008. The Senior Women's team came runner up in 2008. Swan Hill has a horse racing club, the Swan Hill Jockey Club, which schedules around ten race meetings a year including the Swan Hill Cup meeting in June. The Swan Hill St Patricks Race Club also holds a meeting at the racecourse in October. Golfers play at the course of the Murray Downs Golf Club on Moulamein Road. Swan Hill also has Junior and Senior badminton games in Winter at the Stadium every Tuesday night. Juniors from 6pm till completed matches. Then Seniors not long afterwards. The city is located on the Murray Valley Highway (B400), which links it to Echuca and Albury-Wodonga to the east and Mildura in the west, the Loddon Valley Highway (B260) links Swan Hill to Bendigo to the south. V/Line operates passenger rail services on the Swan Hill line, with the local railway station being the terminus. The Swan Hill Airport is also nearby. Swan Hill also has its own public bus network. Swan Hill has one locally produced newspaper in The Swan Hill Guardian, which has been circulating Swan Hill and surrounding regions for almost 120 years. In addition to this, there are four local radio stations: 99.1 Smart FM (3SFM); ABC Mildura Swan Hill (3MIL); 107.7 Mixx FM (3SHI) and AM station 1332 3SH. Swan Hill's television stations are identical to Bendigo's: ABC, Prime, WIN, Southern Cross Ten and SBS. Author James Aldridge grew up in Swan Hill. He described Swan Hill during the Great Depression of the 1930s in his series of "St Helen" novels. Television & Radio Presenter Yumi Stynes was born in Swan Hill, Victoria, where she grew up with her parents, David and Yoshiko, two sisters and a brother. Her father was fifth generation Australian and her mother is Japanese. She spent her teenage years in Melbourne before moving to Sydney to work for Channel V Australia. ^ a b c Australian Bureau of Statistics (27 June 2017). "Swan Hill (State Suburbs)". 2016 Census QuickStats. Retrieved 2018-08-23. ^ Peter Brown. "Kow Swamp". Australian Palaeoanthropology. www-personal.une.edu.au. Archived from the original on 17 May 2008. Retrieved 12 July 2008. ^ Peter Brown. "Coobool Creek". Australian Palaeoanthropology. www-personal.une.edu.au. Archived from the original on 27 April 2013. Retrieved 12 July 2008. ^ Three Expeditions into the Interior of Eastern Australia, Vol 2, by Thomas Mitchell. ^ ‘The Riverine Trade (No. II): Down the Murray’ by ‘Our Special Correspondent’, The Argus, 25 January 1876, page 6 (cols. 1-2). ^ Sid Brown (March 1990). "Tracks Across the State". Newsrail. Australian Railway Historical Society (Victorian Division). pp. 71–76. ^ Roads and Traffic Authority (NSW). "Swan Hill - Murray River Road Bridge". www.rta.nsw.gov.au. Retrieved 2008-07-12. ^ "Connection" (PDF). Mallee Roots. 82 (May): 6. 2005. ^ "Agricultural items". Australian Town and Country Journal. 28 July 1877. Retrieved 2013-01-14. ^ "Swan Hill-Murray River Road Bridge". New South Wales State Heritage Register. Office of Environment and Heritage. H01481. Retrieved 2 June 2018. ^ "Wine Australia - Wine Regions - Victoria - Swan Hill". Australian Wine and Brandy Corporation. Retrieved 17 January 2010. ^ "Climate statistics for Swan". Bureau of Meteorology. Retrieved 27 September 2011. ^ Country Racing Victoria. "Swan Hill Jockey Club". Archived from the original on 19 July 2008. Retrieved 7 May 2009. ^ Golf Select. "Murray Downs". Retrieved 2009-05-11. ^ "Penguin Books Australia". James Aldridge. www.penguin.com.au. Archived from the original on 17 March 2005. Retrieved 12 July 2008.